specifications to meet the growing Global demand of high pressure, cross-country pipeline owners and operators. of the clients from various sectors such as Oil, Gas, Petrochemicals, Fertilizers and Dredging. 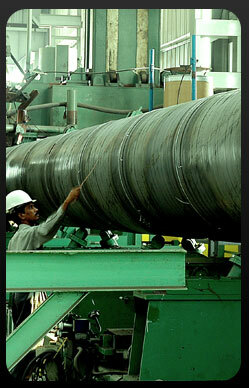 The technologically efficient facilities of Man Industries enable the company to manufacture flawless LSAW Line Pipes. The facilities employ state-of-the-art PLC Automated JCO and 3 Roll Bending Press supplied by CHR Haeusler of Switzerland, high speed Welding Stations, productive Expander and a series of NDT and Laboratory facilities. The efficient & synchronized facilities and trained & experienced manpower has earned the company many National and International approvals from Oil and Gas Majors of the world. Quality has been the prime concern for the company for any of the products it manufactures. To ensure that the products are of utmost quality, Man Industries (I) Ltd. has roped in the world's most advanced technology in this highly specialized and high priority field. The latest, Pre stressed three Roll Bending process from Haeusler, is being used to manufacture pipes of improved strength and toughness. In addition, the collaborators have given a performance guarantee for the plant in terms of production parameters and adherence to all international standards of quality including API and NACE. In addition to the above, the facility of a COLD EXPANDING MACHINE is also available at the works. EXPANDER is imported from Romania to meet the mandatory/optional requirements of Oil & Gas industry. With a state-of-the-art online plate UT Machine, an automated JCO and 3 Roll Bending Mill, equipped with CNC & PLC Controls, state-of-the-art Internal and External Welding Units, On line real time Radioscopy, advanced CNC Hydrostatic testing, On line X-ray / Ultrasonic M/c. etc., we supply quality and flawless steel pipes confirming to API / NACE international standards to meet global demand of a large diameter ranging from 18" to 56" meant for critical applications. We have LSAW capacity of 500,000 tonnes both the plants put together. 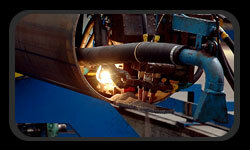 expansion of its Helically Submerged Arc Welded (HSAW) Line Pipe manufacturing facilities. requirements of its world-wide clientele of high pressure/critical application segment. With major expansion of HSAW facility , Man Industries (I) Ltd. has commissioned new production lines in the year 2007 and 2008. In addition to the stable demand of HSAW Line Pipes in the conventional segments of Oil transportation, Water Supply, Sewerage, Agriculture and Construction, there is a global surge in the acceptance of HSAW Line Pipes for high pressure applications (in onshore installations). 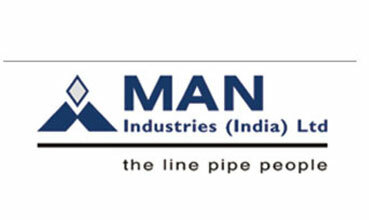 Man Industries (I) Ltd. offers high quality HSAW Line Pipes conforming to globally accepted quality standards. In order to ensure quality products, the company performs various tests and inspections in adherence with the industry standards. The quality check and inspection begins right from the time, the raw materials are procured and ends with the final product. Our continuous automated ultrasound, X-ray, Chemical and Mechanical testing ensures customersâ€™ satisfaction and confidence. In addition to the conventional testing, we can carry out selective testing to assure the desired quality product. Quality Assurance of the facilities complies with the National and International Standards. Facilities available for testing and the patterns are shown in the chart. We have HSAW capacity of 500,000 tonnes both the plants put together. 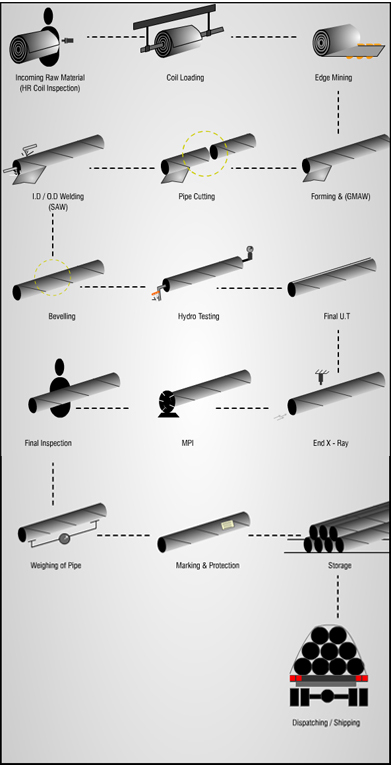 To protect the line pipes from corrosion and to enhance its operational life, Man Industries offers various options of coating systems to the choice of the customer as per the end use of the pipe. The coating is carried out using the latest technology and proven raw materials. The FBE, 3LPE and 3PP coating systems are applied on a single process line. The pipe is first heated to remove any moisture present on the surface. It is then blast cleaned to provide the required degree of roughness and inspected for cleanliness. An acidic surface treatment can be done, if required by the specification. The pipe is then heated by electric induction and FBE is sprayed on the line pipe to achieve the required thickness of this layer. Before the FBE gels, the Co-polymer Adhesive is applied by extrusion method followed by application of PE or PP Layer. The coated pipe is then allowed to pass through a quenching tunnel for cooling. Further inspection and cut back removal takes place after the pipe is sufficiently cooled. 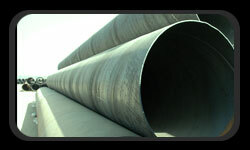 Pipes are coated internally to prevent corrosion and to improve the product flow characteristics. Man Industries offers coating in the form of two part liquid epoxy system in thickness range from 75 to 750 microns. 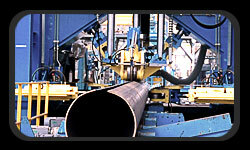 The operation begins with the pipe being placed on the rotator of the Shot Blasting Machine and the hose pipe with a rotary turbine travels longitudinally inside the pipe from one end to other centrifugally emitting the shots-grit mixture with a high velocity to provide the required degree of roughness to the internal surface of the pipe. The metallic dust generated during the blast operation is collected by an efficient dust collector. 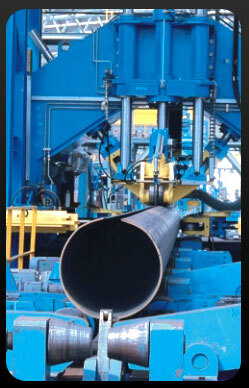 The blast cleaned pipe is transferred to another rotator by the means of hydraulic ejecting and receiving arms. The boom carrying the rotary spray head is inserted inside the pipe, which sprays the epoxy mixture uniformly on the pipe inside surface from one end to other end. The travel speed of the boom flow of epoxy mixture is adjusted to meet the required thickness of the epoxy layer as per the specification. The coating can be performed in single or double layers depending on the thickness of coating. The coated pipe is then rolled over the padded skid to the curing chamber and finally to stenciling and storage/dispatch section. Coaltar Enamel Coating is applied on pipes that are used for both onshore as well as offshore applications. Coaltar Enamel Coating is now being used for over more than 50 years. The coating is applied mostly on pipes that are used in relatively swampy and damp soil conditions and in offshore installations. 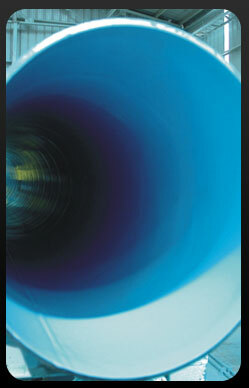 The Coaltar Enamel Coating process first begins by the pipe being externally shot blasted to the required standard. A layer of coaltar primer is then immediately applied on the shot blasted surface. This is applied online immediately after the shot blasting. The pipe is then transported to the coating booth by the means of ejecting and receiving arms and intermediate skid. In the application booth, as the pipe rotates over a parabolic conveyer, the hot molten coaltar is made to fall freely under gravity on the pipe surface with the fiber glass inner and intermediate wraps wrapped simultaneously. As the pipe exits the booth, it is covered with the last outer wrap. Finally, the pipe is made to pass through a tunnel having cold water sprayed on it continuously to cool the coating. After cut back removal, the coated pipe is rolled over a V-board for inspection, stenciling and dispatch. 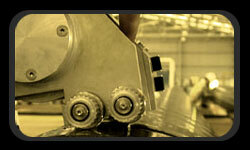 We have facilities to provide coating solutions at both the plants. Give us a call today to get all the information, +91-9819591024, If you're looking to buy or sell Man Hsaw Lsaw Coating Pipe, we can help., call to our Distributor in India or mail us to info@neelconsteel.com for instant free quote of Man Hsaw Lsaw Coating Pipe. Neelcon Steel Wholesale Various High Quality Man Hsaw Lsaw Coating Pipe in all shapes and sizes and with any specifications that the clients, More then 1500 Worldwide.